f. Hey there's lots of detail to be seen here... especially in the antennae. I am curious. What's it look like if I zoom right in at the center? Hey, that shape looks really familiar, so I decided to stay with 256 max iterations for a couple of steps. Why is there a difference? 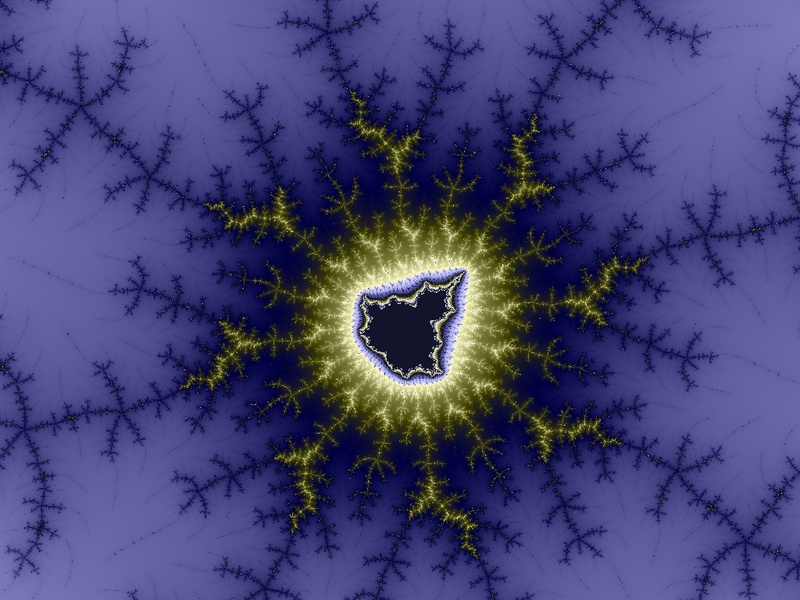 Colors in the Mandelbrot set are selected by counting the number of iterations it takes the function (z^2+c) to become unplottable. In the picture with 128 as max iterations, there is less detail because the program stopped trying to decide what color the pixel should be (and chose the default color which is sort of tan) much much sooner than the one with the 2000 iteration maximum. More and more detail appears when you let the program try harder as you zoom in closer and closer to the objects you want to see. There is a limit to how much more detail will appear with this method. 256 iterations shows nearly all the detail there is to see. After a while, altering max iterations just changes the color of the area that could not be plotted (remember that color is selected based on the number of iterations, so changing the maximum just lets it select a color that corresponds to a different number of iterations than the previous maximum). h. OK, back to hunting. Sure enough, more detail shows it wasn't a plus sign to the left of, and above the dot, either, there are 5 antennae. I see the pattern that I didn't realize before. A quick look back to picture f shows that there are 5 antennae (although more complicated) below the dot I chose to inspect. Then, zooming in again, I see that these 5 antenna junctions are all over the place! j. That's an interesting formation between the two biggest antenna junctions on that main spike pointing straight up in the middle of the image. I wonder what that's all about? m. Hey look at that!! There IS something interesting in the middle of that bar going across. I wonder what it is? o. There is something non-lightning about that bit in the middle. What is it? Hmmm. This looks like a shape I recognize. I wonder if I should just change max iterations to 2000 and get on with the play? Click here or the image to see the full sized rendering of the snowflake Mandelbrot (1024 x 768 24-bit color 289kb). Click here to see the full size ant-aliased (smoother shapes and lines, really cleans up the corona) version. I would show you a thumbnail, but this small, the anti-aliasing has no effect as reducing the size does much more ant-aliasing than necessary. This image is also 1024 x 768 pixels with 24-bit color. It was rendered at 2048 x 1536 and then reduced by half in the anti-aliasing process. Click here to see the movie of the zoom. Each frame was rendered at 160 x 120 with max iterations of 2000 and there are a hundred frames at 6 per second. It's not quite smooth, but I wanted to do something that could be downloaded relatively easily. This is a 507kb download, not for the faint of heart, but well worth it for zoom lovers.